Bane's speech to the people of Gotham City from The Dark Knight Rises was pretty awesome. But what if the Joker had given the speech instead? That's what a user who calls himself Pgirts decided to find out. Now, to clarify, this is an impression of the Joker from the Animated Series, not Heath Ledger's Joker from The Dark Knight. So this is a guy doing an impression of Mark's Hamill's Joker doing an impression of the speech by Bane from The Dark Knight Rises. Everybody got that? Good. So it's a dude talking like another dude talking like another dude from a movie. Got it. 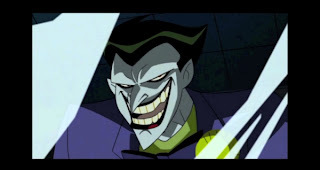 Yeah yeah - guy guy guy - okay but look - that guy is doing Mark Hamill's Joker DEAD ON - like as in I think it almost has to really be Mark Hamill fooling around - and now I'm thinking if someone could find a Kevin Conroy soundalike we could gear up a hell of a Batman animated fan film! Sounds like Billy West (Fry, Prof. Farnsworth in Futurama). I haven't seen Batman: The Animated Series in a long time, so that's as much as I can say. Similar to Hamill's Joker, but it just sounds more like West doing his version. That was a pretty awesome speech. The soundtrack and the voice were synched well. Too bad he didn't put some actual video with it. But great nevertheless! That was killer. I just tweeted it. That's a pretty eerily good impersonation. Well done.